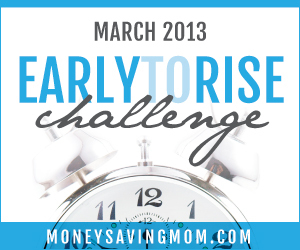 This is Day 27 of the Money Saving Mom's Early to Rise Challenge! 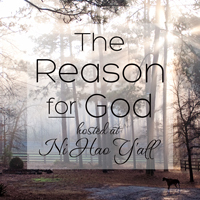 Today we're encouraged to change our outlook on whatever or whomever we're frustrated with. Currently I am personally frustrated with my health issues. I'm also frustrated with the seemingly never endless housework. But for now we'll just go with my health issues. 1. I have an immune system - This alone is huge because lots of people are born without any kind of an immune system in place. I cannot imagine all the complications that could come from that alone. 2. I have a thyroid - again, huge because some people have had to take theirs out or have it destroyed. 4. We have access to various medications and doctors - we can find a medication that not only works best for us, but we also can change doctors if we feel the need to. 5. We have transportation to get to and back from the doctors or pharmacy. - This is huge too, because it means I can get myself to the doctor safely and quickly if need be. So even though I feel like I'm going through a tough time right now, I have this and so much more to think about and keep me positive. I don't think it will make me start liking my Graves Disease, but to change my outlook on it will help me not dwell on it so much. So, what time did I get up today? 5:15 am. Not too bad, but I'm really feeling the need for a cuppa joe right now.